Last week, all I wanted was a bowl of soup. The idea would flitter across my mind throughout the day: Want. Soup. I even started eyeing the cans of Campbell’s at the far back of the cabinets that we keep on hand in case one of us gets sick and needs a salty childhood comfort food, which I’d pretty much never eat if well. Tuesday, it rained all day. It was overcast and cold, and my husband had gone out to meet up with some former workmates. I was cleaning out the fridge, trying to assess what I still had and what I was going to need from the greenmarket that week. I found three bunches of carrots I’d bought the week earlier, brought home, and then completely abandoned in the fridge. Some had gone a little squelchy, but about a pound of decent ones remained, so I decided, at 8pm on a Tuesday, to make carrot soup. I sat down at my laptop and googled +”carrot soup” +recipes and got several thousand different recipes. Creamy carrot soup, curried carrot soup, Thai-style carrot soup… this was going to take a while. I peeled the carrots, covered them with water, threw in a bouillon cube and a cube of ginger I’d frozen, set them to simmer and sat down to read recipes. Cook until carrots are tender. Puree with immersion blender (or regular blender), adding more liquid to desired consistency. Creamy Mexican-style. Add crema mexicana (or crème fraîche or sour cream) and a pinch of cayenne pepper, salt and pepper to taste. Pepitas to garnish. Spicy Thai-style. Add a little fish sauce, some chili sauce and a big squeeze of lime. Maybe some crushed peanuts on top. Tonight’s forecast says showers, so I’m taking that as a good excuse to make this soup again. I’m already thinking about what I’m going to try in it this time–get your suggestions in now and I’ll try them out. I like my carrot soup chilled, with ginger and lime. But you are right: it is definitely a great blank canvas! Yum, sweet sweet carrots! Dee-licious and New-tricious! Yea! on the recipe improvisation. Some of my favorite meals were discovered this way. 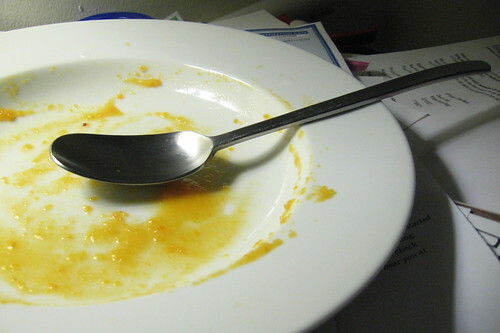 I think your photo is perfect…the empty plate says it all. What a shame to have a curry allergy! I hope that you get that sorted out. I can definitely relate to those soup cravings. I went on a road trip to Yellowstone recently and despite eating in some of the finest steakhouses that Wyoming had to offer , what I wanted most all along the way was vegetable soup. Your basic recipe sounds like an ideal blank canvas. Thanks for the inspiration!